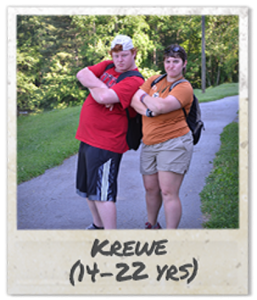 The Krewe program is designed for returning campers who have successfully completed the Leadership program (This is a requirement for acceptance to this program.). Krewe focuses on real life job skills such as time management and accountability as well as learning what it takes to be a Talisman staff! Campers in Krewe are an integral part of making sure camp runs smoothly. Krewe campers assist with tasks such as helping the kitchen after meals and acting as good role models for younger campers. Krewe members also learn to manage greater freedom and responsibility. Because of their work contributions, Krewe tuition is about half the price of other sessions. Krewe members are similar to interns, ready to learn how to hold a job and be a contributing member of a community. They are not considered to be staff, or even junior staff, but are at the pinnacle of their Talisman experience. Krewe members meet as a group about twice a day to discuss expectations, get assignments, and then later to debrief their day. They must have proven themselves in Leadership to be ready to put their own needs aside for a time, and consider those of others. They learn a lot in this program about how hard it can be to do that for several hours in a row, and to maintain a positive attitude and good work ethic. Perfection is not expected, and problems are used as valuable lessons, with the Krewe staff ready to coach them through difficulties. However, Krewe members are expected not to have problem behaviors, and if they do, may be moved to a regular camp group for further growth. Successful Krewe members leave with a positive written job reference and readiness to take on work in their community. Krewe meets each morning to learn job skills and prepare for their daily assignments. Those often include helping clean dishes in the kitchen, assisting staff of younger groups, restocking paper supplies, and other necessary tasks at camp. The Krewe staff person focuses on helping them practice particular job skills, such as time management and being on-time to work, doing quality work, resolving issues in the workplace with co-workers and the boss, and asking for help when needed. Individual coaching sessions take place frequently to offer feedback or help the camper work out a solution to a problem. Krewe also has a lot of camp fun; sometimes they will join other groups who are going on an adventure (hiking to a waterfall or rock climbing, etc.) or will go to town as a group themselves. They are allowed more freedom to move about campus as well, and may choose to spend downtime at the pond or pool if a group is there, or reading or game-playing with a peer. For a few qualified participants, Krewe may be a step toward becoming a Talisman counselor one day.